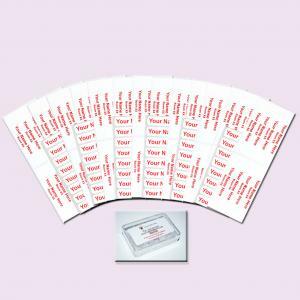 This clothing namelabel pack offers great value including all the labels needed - suitable for labe.. This respite care name label pack offers great value including both ONCE™ iron on and tagg on labels.. This clothing name label pack offers great value including both sew on and stick on labels - suitab.. This clothing name label pack offers great value including both ONCE™ iron on and stick on labels - .. This clothing namelabel pack offers great value including both tagg on and stick on labels - suitab..
Name label packs for clothing and personal possessions are specifically designed for care home residents. 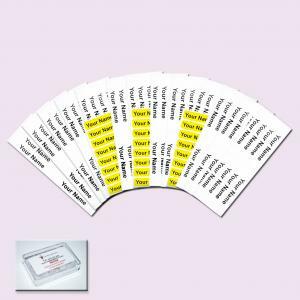 Offering great value these packs include a selection of best-selling name labels in smaller or larger quantities, suitable for respite or longer-term stays. To order simply decide which pack you want, insert the name you want on the labels, choose your favourite image (or leave blank) and colour of labels. All our name label packs ship the same day (orders before 2pm weekdays) with FREE UK delivery as standard. Not found what you want? Why not visit The Name Label Company site if you are looking for children's school label packs.